The Washington Post‘s fact-checker gave Sen. Bernie Sanders (I., Vt.) four Pinocchios, its worst rating, for inaccurate claims he made about gun sales without background checks. Sanders said on NBC's "Meet the Press" Sunday that "We have to end the absurdity of the gun show loophole. Forty percent of the guns in this country are sold without any background checks." 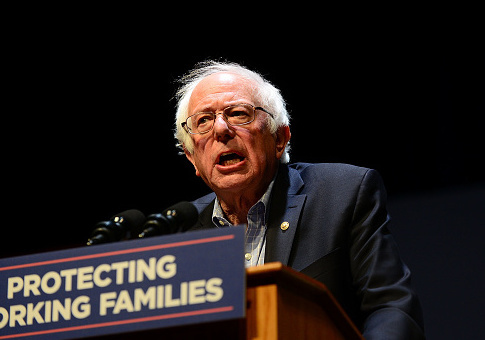 Post fact-checker Glenn Kessler was scathing of Sanders' untruth straight from the start, noting he has addressed the inaccurate claim in the past. Kessler classified the false statistic among the "zombie claims," false facts that keep being repeated "no matter how often we fact-check them." "We thought we had long ago buried this false claim," Kessler wrote, "But it has once again risen from the dead! Let's explore." The first time the Post encountered the statistic was when former President Barack Obama referred to it in the wake of the Sandy Hook Elementary School shooting in Newtown, Conn. The Department of Justice study behind that statistic was based a small survey about gun ownership administered in 1993 and 1994. The Brady Law, which federally mandated background checks, only went into effect in 1994. Kessler went on to point out a number of other issues with the study and the 40 percent figure. The original report carefully used terms such as "acquisitions" and "transactions," which included trades, gifts and the like. This subtlety is lost on many politicians, such as Sanders, who referred to weapons that are "sold." But it’s an important detail because many of the people who obtained a gun without a background check either received it as a gift or inherited it. Why is it important to make a distinction between purchases and transactions? For one thing, the failed 2013 Senate compromise bill that would have required background checks for gun shows and Internet sales specifically made an exception for gifts (and even sales) among family members and neighbors. Including the data on such transactions can change the results. Kessler further noted that more accurate data has been produced since the 1994 numbers. But Sanders now has even less of an excuse than Obama. That’s because in 2017, researchers at Harvard University finally published a new survey — and they found that 22 percent of gun owners who reported obtaining a firearm in the previous two years did so without a background check. That’s almost half the percentage of the old figure. Though Sanders referred to the "gun show loophole," not a single person surveyed said they obtained a weapon at a gun show without a background check. Sanders spokesman Josh Miller-Lewis said Sanders provided the best information he had at the time, and he claimed the exact percentage is irrelevant. "Senator Sanders on Meet the Press provided the best information he had at the time," Miller-Lewis said. "It appears the number he cited may be outdated. But whether it’s 40 percent or 22 percent of guns being acquired without a background check, millions of Americans still obtain guns without background checks. That’s absurd. No one should be allowed to purchase a gun without a vigorous background check." Kessler ended his summary by saying that while the 40 percent figure has always been inaccurate, there is now more than ever no excuse to use it. "It’s bad enough that politicians four years ago were using stale data and mischaracterizing it." Kessler wrote. "But now that the research has been updated, Sanders has even less excuse for relying on two-decade-old figures. The most recent research indicates that just 13 percent of guns — not 40 percent — are purchased without a background check." "Please, folks, let's keep this zombie stat buried from now on," Kessler concluded. This entry was posted in Politics and tagged Bernie Sanders, Glenn Kessler, Gun Control, Washington Post. Bookmark the permalink.